Today is the first official day of Summer! (Even though it has felt like Summer for a while!) We are celebrating with ice cream. 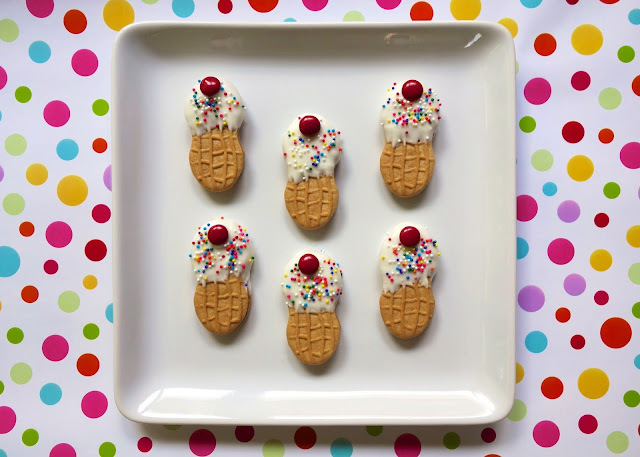 Not just any ice cream, these super cute Nutter Butter Ice Cream Cones. They are great because they won't melt and get messy. This is a great treat to do with the kids. They can decorate the cones with any color sprinkles they like. 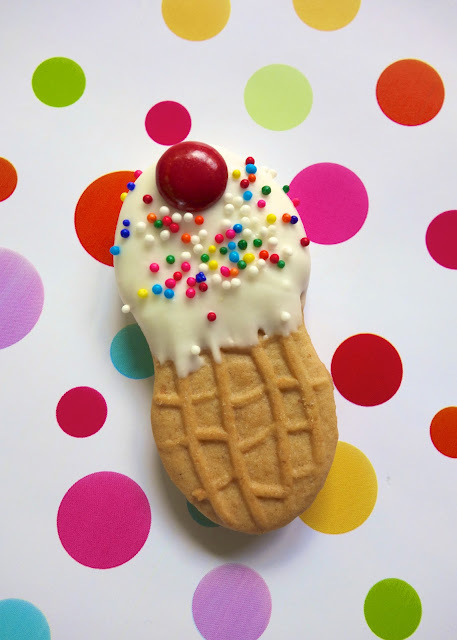 These are so much fun to make and even more fun to eat! Happy Summer! Line counter with wax paper. Melt almond bark or candy melts according to package directions. Dip Nutter Butters halfway into the candy melts. Shake off any excess candy coating. Place on wax paper. Top with M&M and sprinkles. Repeat with remaining cookies. Allow to set, about 5 minutes. Enjoy! These are just adorable!! Yay for Summer!! Very cute! Is that a polka dotted tablecloth? Where didn you get whatever that is? LOVE it! Lauren - that is actually wrapping paper. I got it at Hobby Lobby.